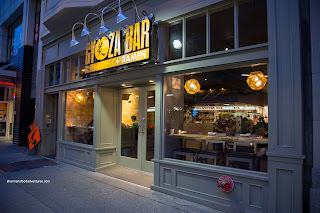 It's been a long time since I had originally visited Gyoza Bar when it first opened. We went with a pretty large group and ended up trying a good variety of dishes. We loved the simple, yet elegant space featuring an open kitchen. 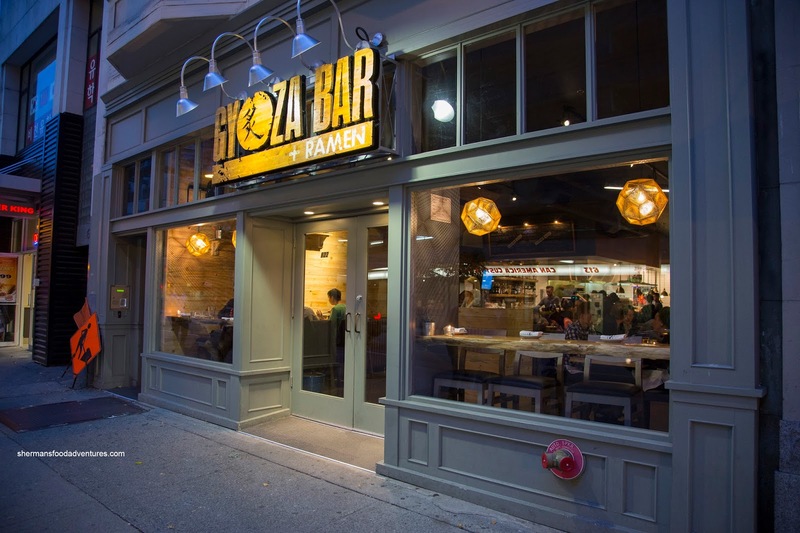 Living up to its namesake, the gyozas were pretty good (at least the pork version was) and aesthetically-pleasing. We weren't as convinced with the ramen and the other creations as much. Shortly after that, they changed the menu and added build-your-own bao boards. I never did get to try that, but that was about to change as I re-visited the place with Sharon, Nicole and Nora. 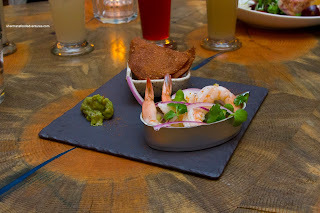 In addition to some tasty beverages, we were started off with the Prawn Ceviche accompanied by gyoza skin crackers. The large and meaty prawns were naturally sweet with a firm snap. I didn't find them to be particularly flavourful on their own, but when combined with the yuzu citrus marinade, things livened up. The brightness of the citrus was further amped by the pungency of the red onion and cilantro. 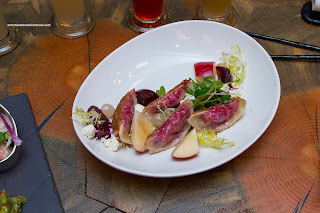 Visually stunning, the Roasted Beet Gyoza surprised me since it was almost "meaty". The Earthy shredded beets were mixed with feta cheese offering up a robust texture. As evidenced in the picture, the dumpling skin was ultra-thin and seared up crispy on the bottom. Onto an actual meaty offering, we had the Hamachi Kama that were nicely fried up where the meat was moist and sweet. There was definitely the taste of the sea happening here where the natural flavours were not drowned out by the sweet and salty soy dressing. I found that the veggies underneath soaked up all of the sauce and hence were a bit overseasoned. 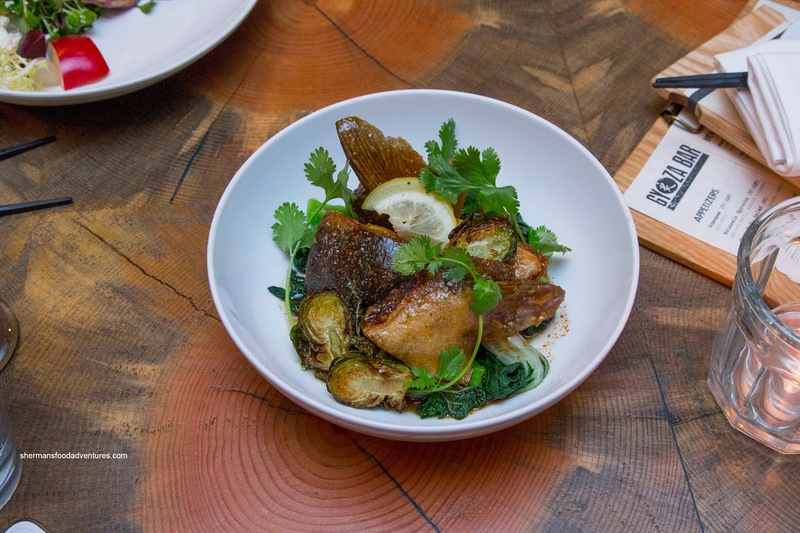 But it really was all about the fish where the collar meat was on point with an almost buttery texture. 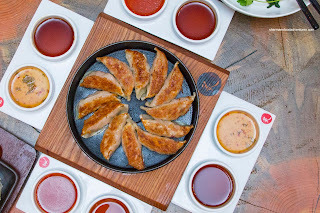 A visit to Gyoza Bar wouldn't be complete without an order of their Pork Teppan Gyoza served with spicy miso and umami soy. They've changed their recipe since the last time where the pork is less processed being meatier and chewier (in a good way). Therefore, the gyoza ate more substantially. The dumpling skin was razor thin being appealingly chewy while the bottom was nicely crisped up. We also tried the Chili Shrimp Teppan Gyoza featuring the same features as the pork gyoza except with buttery and sweet shrimp. We found a few of them to be a touch salty though. It came with cilantro-garlic vinegar which was tart, sweet and aromatic. The most impressive dish was the Family Bao Board consisting of Soy-Garlic Tenderloin Skewers, Korean-Spiced Pork Rib, Maple Garlic Soy Chicken Skewers and Miso Baked Scallops Dynamite. One of my favourites was the sous-vide ribs where the meat was super tender and aggressively lacquered with a sweet and spicy gochujang glaze. Since the scallops were served whole, guts and all, the flavours were not only sweet, but also incredibly briny. For me, I loved it as well as the spicy and buttery miso sauce. 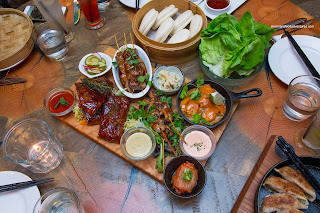 Condiments on the board included pickled cucumber, Asian slaw, kimchi, gochujang, srirracha aioli and herb dijon aioli. We ended off the main dishes with the Tamari-Shoyu Tonkotsu Pork Ramen with chashu and ajitama egg. 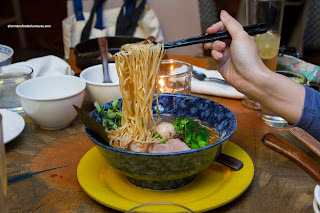 I found the pork broth to be flavourful with a certain umaminess that was Earthy and rich. It was somewhat silky with a considerable amount of meatiness as well as understated saltiness. The noodles were thin and chewy, but I personally prefer them to be thicker. With that being said, it didn't make or break the dish. Fatty and meaty, the chashu was texturally more firm than buttery while the egg was perfectly runny. I would've liked to see larger slices of chashu though. For dessert, we were served a plate consisting of Japanese Green Tea Cheesecake and Mochi Ice Cream. I absolutely loved the cheesecake as it was rich and immensely cheesy. I didn't think the green tea was that noticeable though. 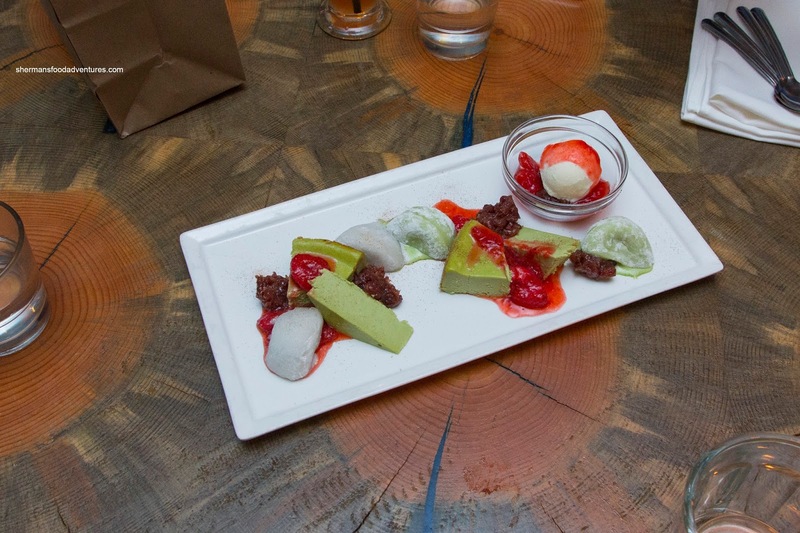 The mochi was soft with a slight elasticity while the melted ice cream was semi-sweet. 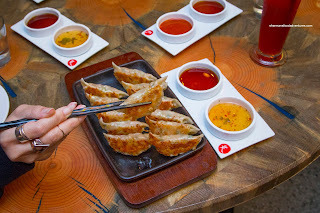 Overall, this revisit was pleasant where the gyozas remained the star of the show. However, the interactive and visually-appealing bao boards add a fun and tasty option. As for the ramen, the broth was better this time around while the noodles were chewy (I still personally like thicker ones though). I will be returning for sure and it doesn't hurt that there is a Travelzoo coupon available too.